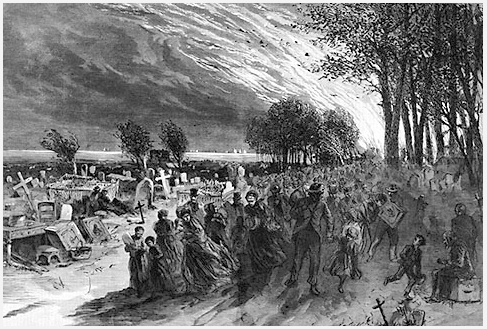 As the final factor in the transformation of the City Cemetery into Lincoln Park, the 1871 Chicago Fire destroyed all traces of many graveyard features. In doing so, the burnt landscape also caused graves to lose their markers, leaving no means to account for the remains below. The illustration on the right is titled, "The Rush of Refugees through the Potter's Field toward Lincoln Park." Rendered by Theodore R. Davis, it was published in Harper's Weekly in 1871. It is possible that the picture is an exaggeration, but the scene reads accurate relative to narrative accounts of the experience. People fled north away from the city, and east toward the lake, escaping the smoke and flames. They carried along their possessions, and stories include descriptions of furniture and other household items resting among the gravestones. It was reported that tens of thousands of people crowded the lakeshore City and Catholic cemeteries. I believe the often recounted stories of people escaping the flames by hiding in the open graves of both cemeteries, to be exaggerations. While it may be that disinterments were occurring during that October, it seems improbable that many gaping holes were left in the landscape during that process. Also, it would seem likely that many more narrations would detail that gruesome aspect of the two day long event. Read narrative accounts of the fire as it affected the two cemeteries, here. 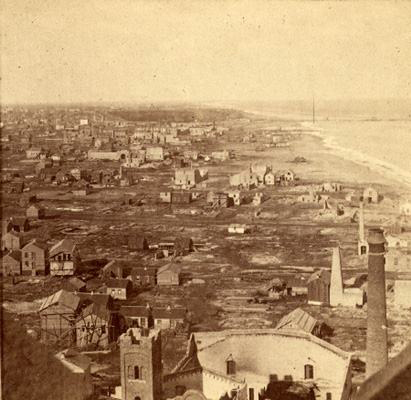 This 1871 view from Chicago's then-new Water Tower, which survived the fire, is one half of a stereo image by G.N. Barnard. A stereo image is meant to be presented as one of a pair. When viewed with the proper optical device, the images render together as one three-dimensional picture. See more views of the ruined Chicago, here, from the Web Site referenced below. The J.V. Farwell pier is visible in the distance, marking North Avenue and the boundary between the City and the Catholic Cemeteries. See an extensive treatment of the Chicago Fire on the Chicago History Museum and Northwestern University collaborative Web Site, The Chicago Fire and The Web of Memory.